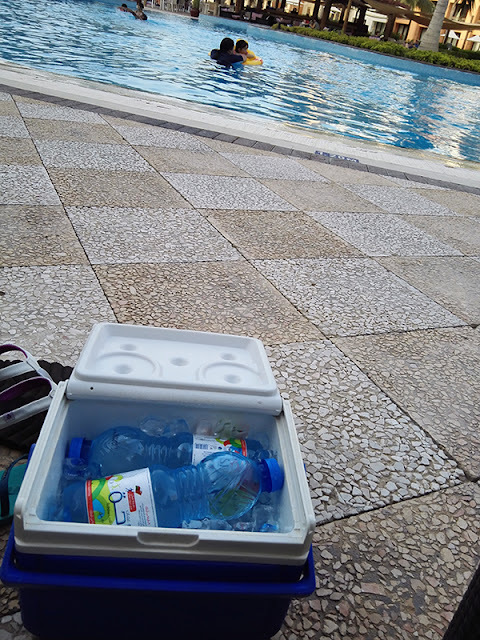 It was 45°C. Oh man! 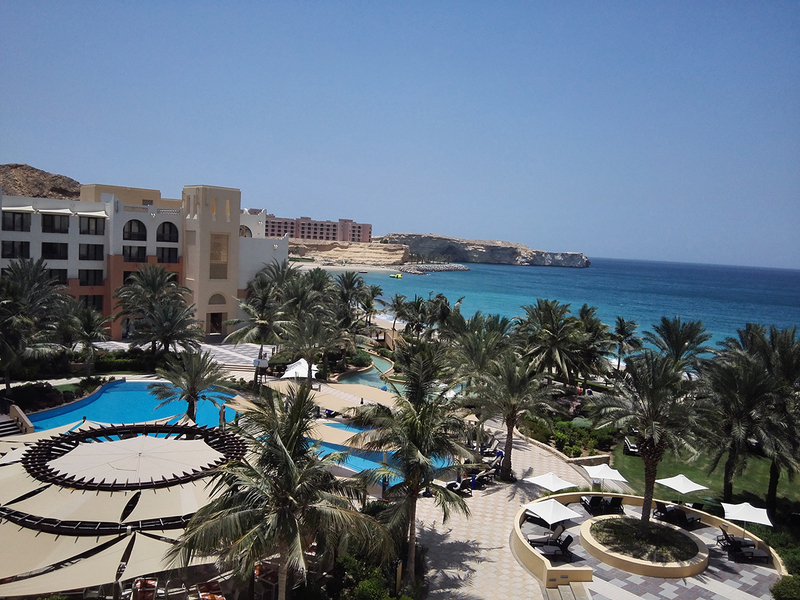 Rugged yet majestic rocky mountains and a sparkling sea view welcomed us as we look out from our room in Shangri-La Barr Al Jissah Resort and Spa. We reached the hotel around 12:30 midday, after a 40-minute smooth cab ride from Muscat International Airport in addition to an hour flight from Dubai via Oman Air. 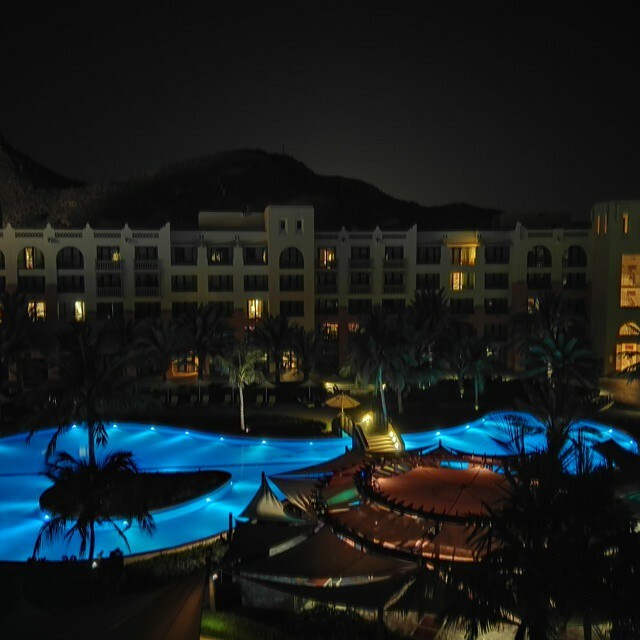 Shangri-La is a luxurious three-hotel village in the sultanate capital of Muscat. The hotels are Al Bandar, Al Husn and Al Waha. 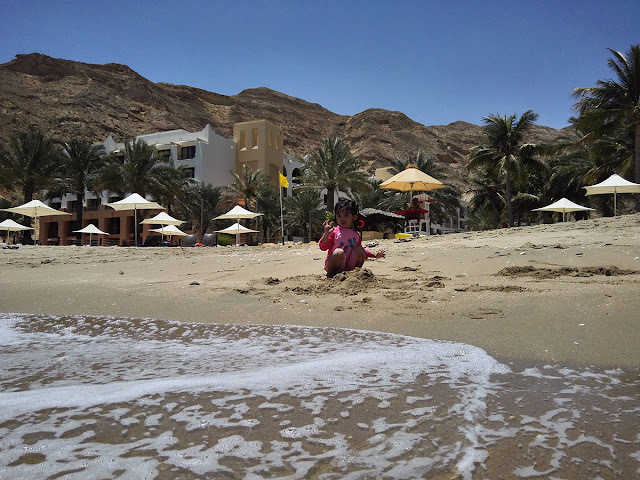 We stayed at Al Waha. 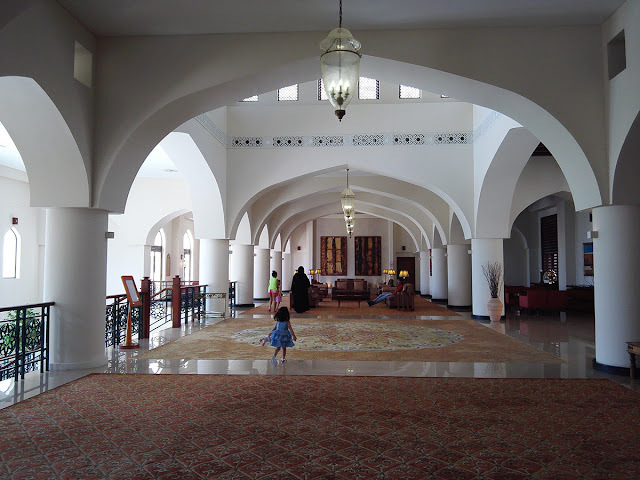 It is Oman's first family-dedicated hotel and the largest of the 3. 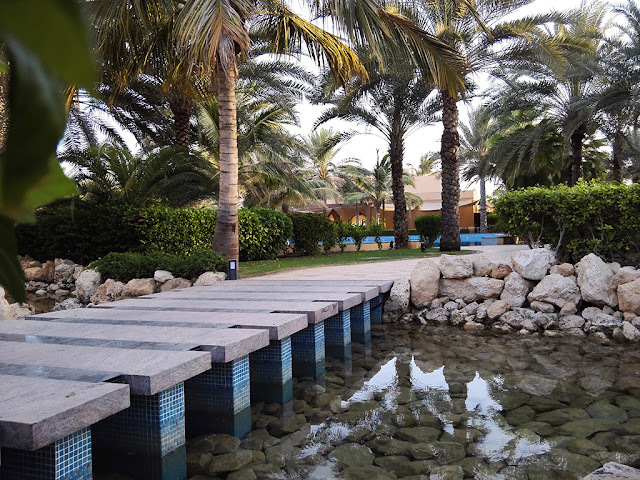 The name Al Waha means "The Oasis", and has been designed such that the hotel's several swimming pools form an oasis incorporating many date palm trees. The architecture of Al Waha is traditional Dhofari, from the southern region of Oman. Nestled at the foot of a mountain range, vehicular access has been made possible by a man-made tunnel. 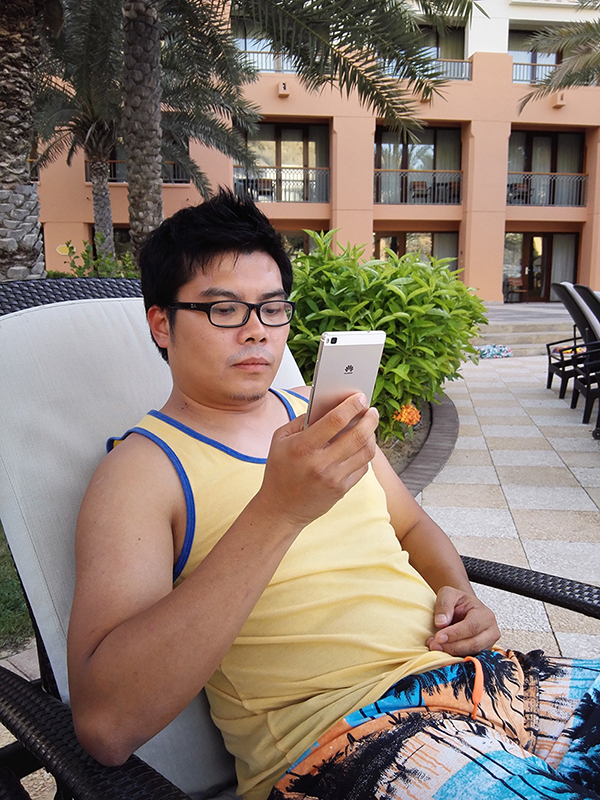 We have access to Al Bandar area, but the hotel was closed due to preventive maintenance. Some restaurants were also closed because of Ramadan. 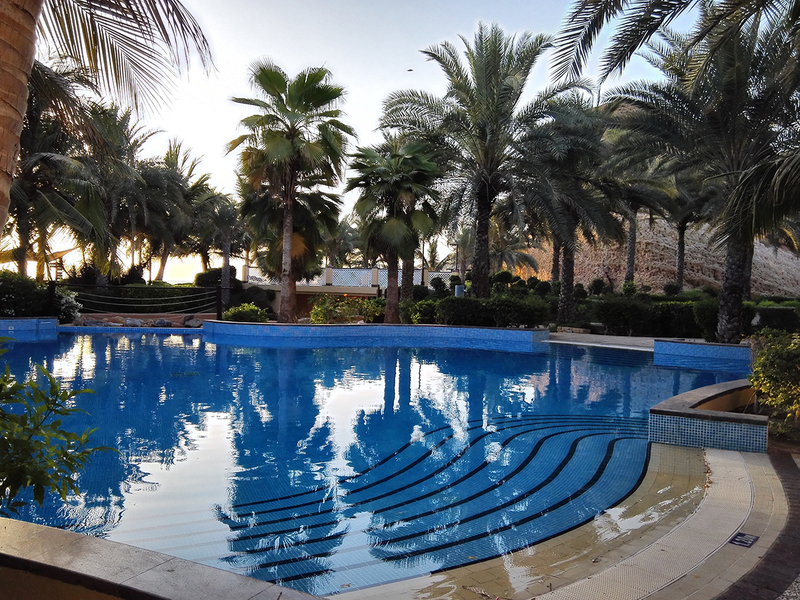 Al Husn is an exclusive private hotel situated on top of a cliff. The check-in was fast and easy despite of quite a handful guests at that time. 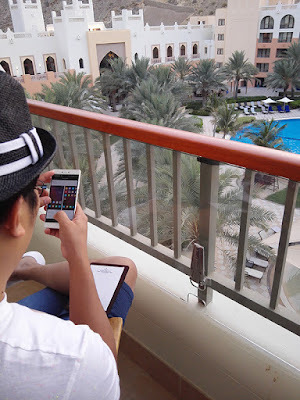 The wifi access was given instantly with the room key cards. 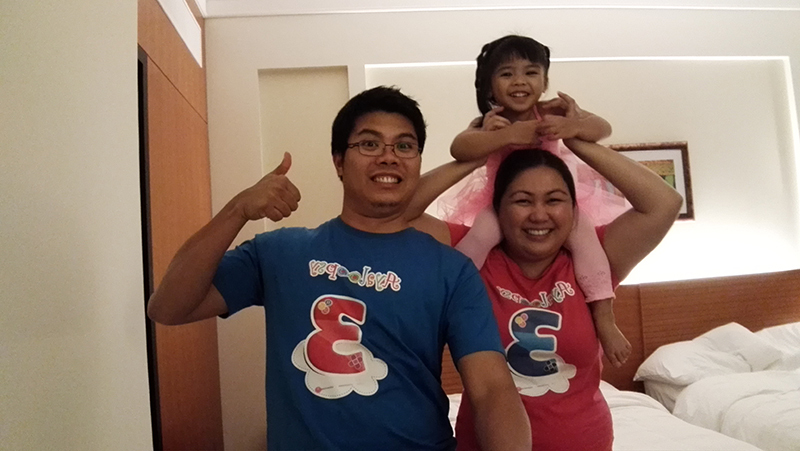 We knew there's a pleasurable experience waiting for us, since we were greeted with smiles and courtesy. 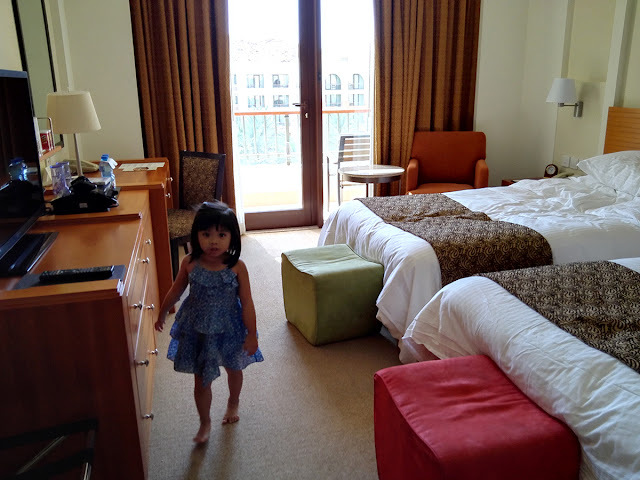 We had an interconnecting family room at the 4th floor (the highest floor level), which is pretty too much for our family size. There's a king-sized bed on one room, and twin bed on the other - each with its own bathroom. After 5 minutes of settling in, our little girl had already jumped and bounced herself on all three beds. Then she noticed the platter of fresh apples on the side table and immediately munched on one of them. 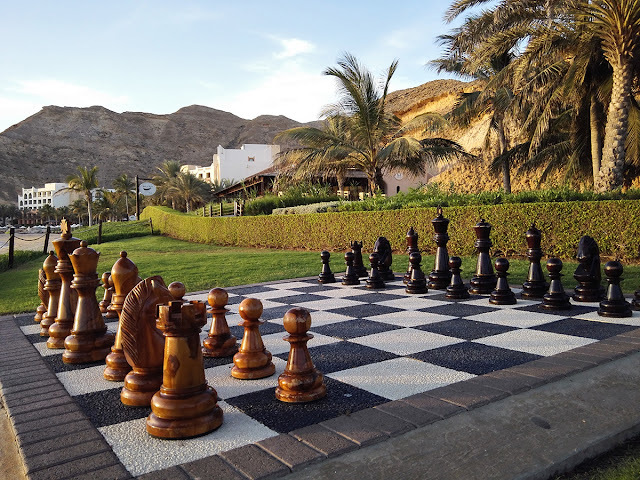 We have a small balcony overlooking a garden of date palms, the main pool, the lazy river and breathtaking views of the beach and the mystical mountain range backdrop. 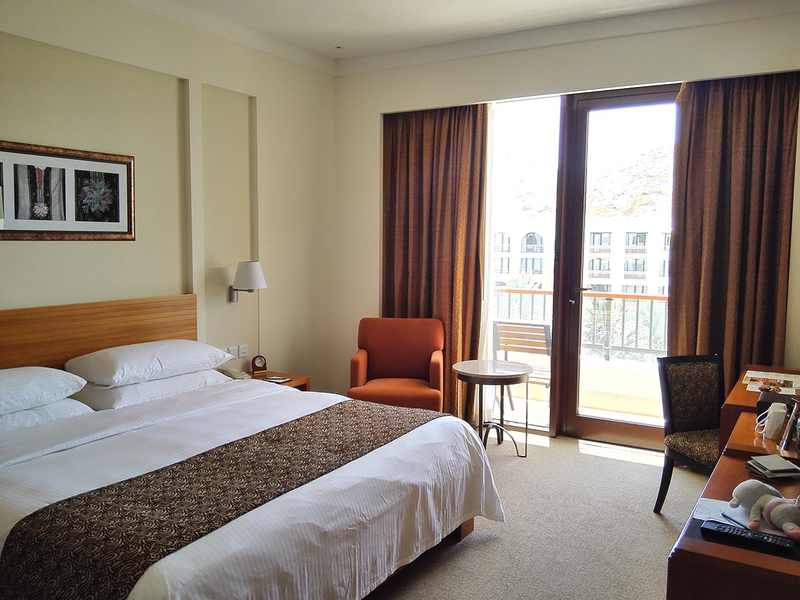 The rooms are well-groomed. The bathroom complete of all necessary kits and supplies. The carpets and curtains dust-free and clean. There's a smart TV which we can use for social media - if in case the mobile phone's not enough. There's a DVD, a playstation 3 and a game CD as well. Too bad my daughter, at her age, isn't into gaming yet. 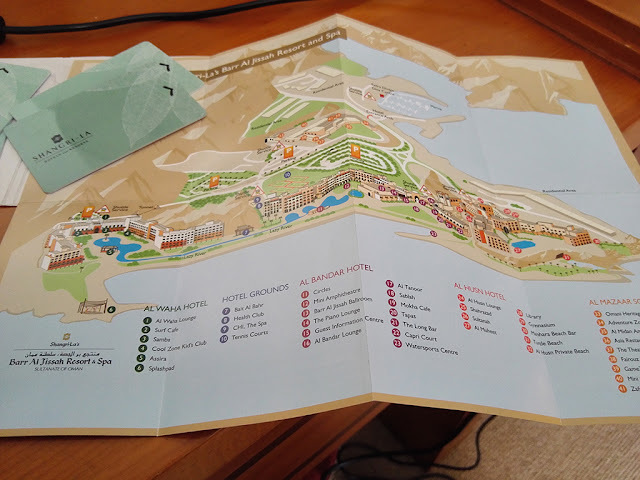 We opted for in-room dining service upon arrival for quick lunch as we can't wait to go out and discover what fun the resort has in store for us. 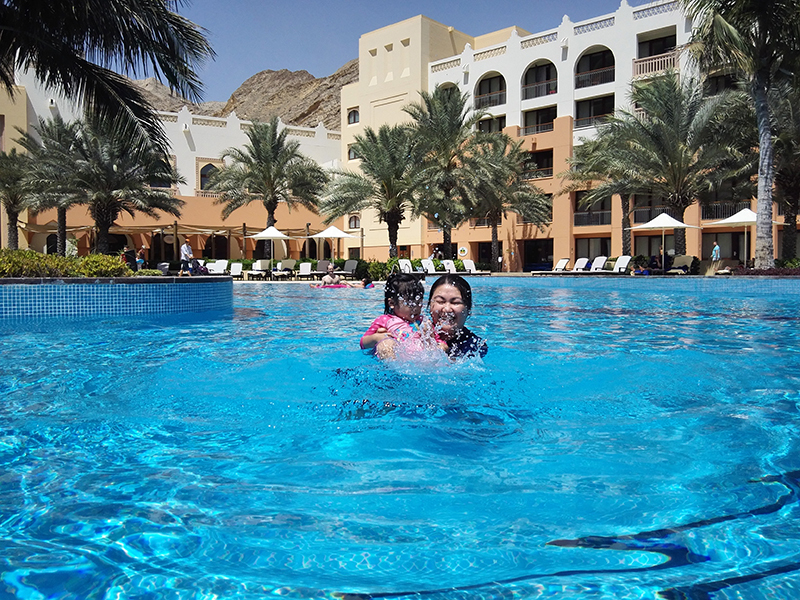 We spent our second day swimming, mostly. Well, if you have a 3 year-old this is what would fill your itineraries. 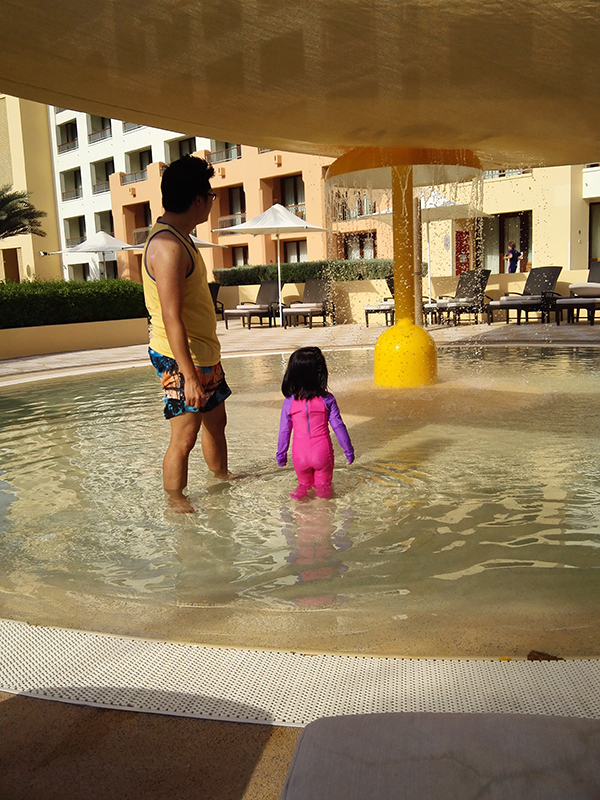 We liked it in the big pool just beneath our balcony because the water is not too cold. It is about 5.5-foot deep. Little Aya has her floaters anyway. We tried to put her in the kiddie pool but the water was purposely cooler (because it's summer? ), but it was too cold for her. We were instantly given our towels and a complimentary cooler box with 4 icy chilled mineral water bottles. It's unlimited - superlike in this kind of weather! They also serve complimentary watermelon slices in small plates. Not bad at all, as we just moved to the lazy river next to the pool area. It is a half-kilometer water strip that gently flows from Al Waha to Al Bandar side. It's a calm yet very enjoyable ride on the waterway with palm trees and other plants on the surroundings. We We didn't just float around, we also used it as a great way to roam from one spot in the resort to another. 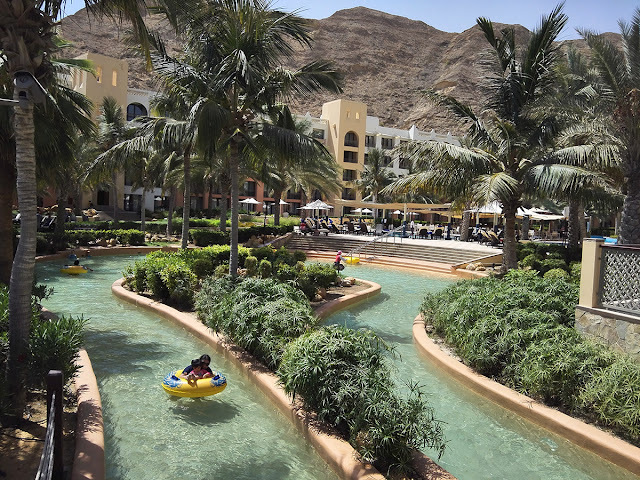 The design of the lazy river is inspired by the centuries-old falaj system that brought fresh water to remote Omani villages. A splash pad is not too far away. 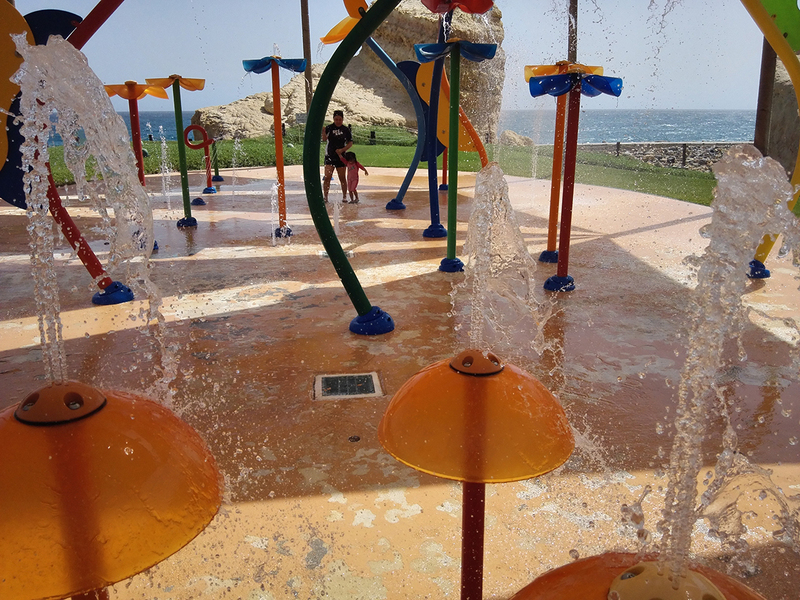 Water sprouts and kiddie fountains and water pails splash over us - a sure thrill for the little one. It was sunny but too windy at the same time we were chilling as we move to the next activity. And we're off to the shores. The main private beach is a kilometer stretch of pure and soft grayish sand along the breezy waves of turquoise water. There are beach loungers, showers and bar service for light snacks as well. Aya had a great time building sandcastles. There are water thrills to do but are very limited. Jetskis are not allowed, and so are paragliding and similar sports. 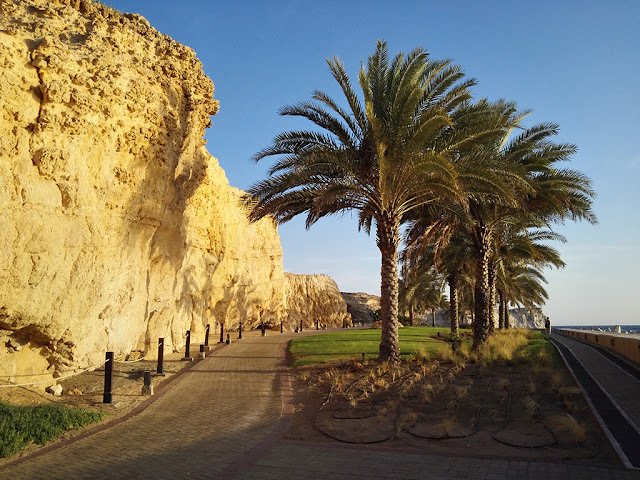 The reason - the site is one of many conservation areas in Oman. So all water activities are planned and conducted with sensitivity to preserve the unique ecosystem. As what the hotel promised, there's quite a lot of activities for the kids. Taking a break from swimming, we brought Aya to Cool Zone Kids Club. 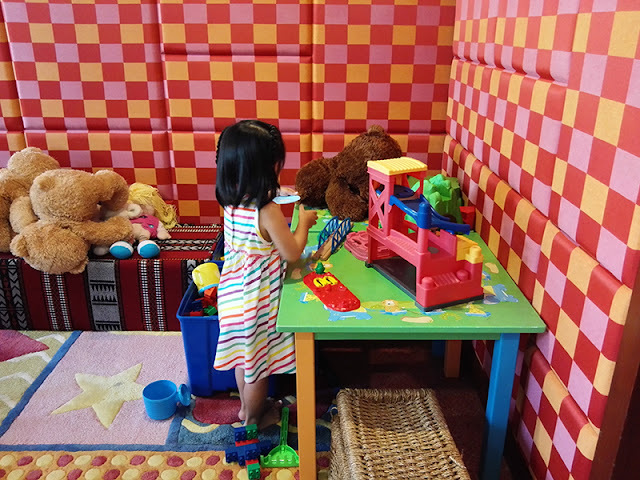 It's a small room with nannies and caretakers that look after the kids. 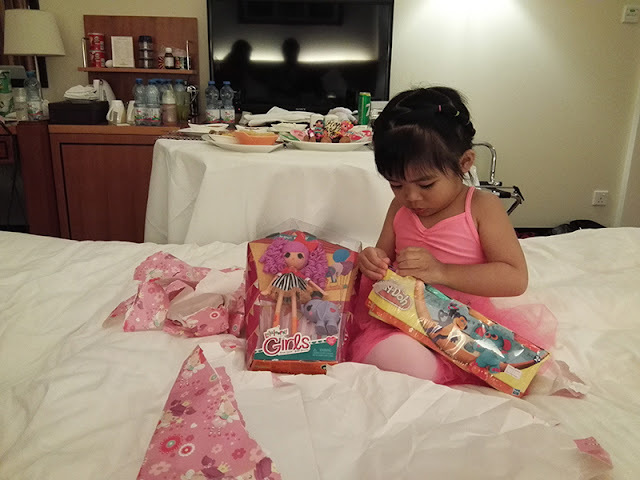 Aya played with soft toys and bikes with the other kids. They can also watch TV, paint and create artworks of sorts. On our last few hours, we brought her to Adventure Zone in Al Mazaar souk. 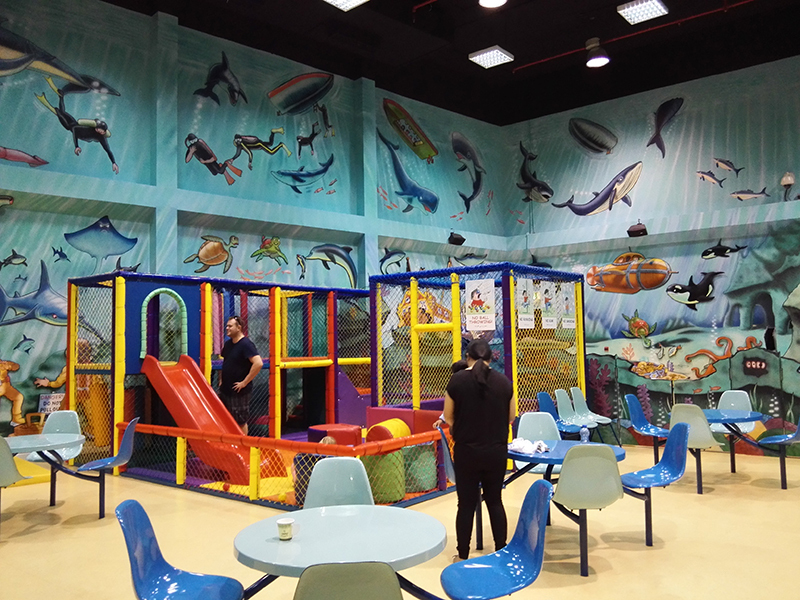 It's a huge indoor play area enclosed in vibrant and colorful murals. It is adjacent to the Omani Heritage Village and just a 3-minute coaster ride from Al Waha. Children (and parents) must wear socks. Aya wasn't wearing hers so she was given by the attendant. A mandatory long-sleeved shirt was also given free to her. 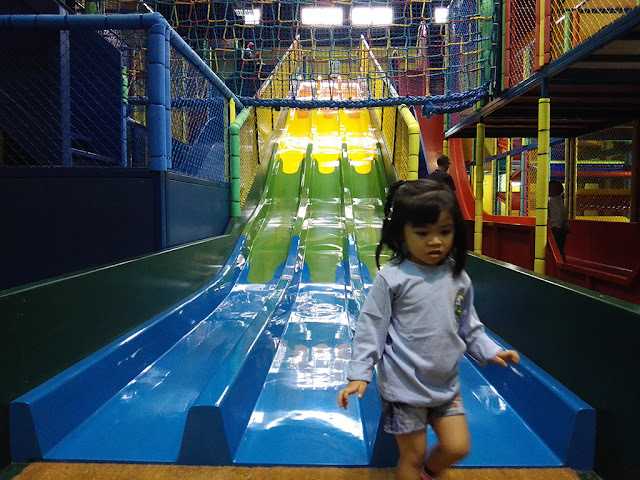 There are obstacle courses like 'Over Under Hurdles,' 'Swing Over Net' and wall climbing. The main attraction here is the three 6.5 meter high drop slides where kids and parents sit in a mat to slide down. GameZ, also in Al Mazaar, is for billiards, air hockey, electronic darts and video games. 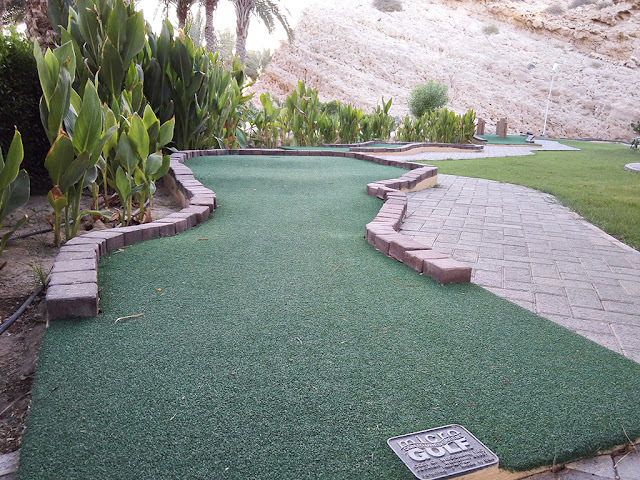 There's also a mini golf and a camel and pony ride. We had fried chicken wings and grilled salmon for lunch, in-room. 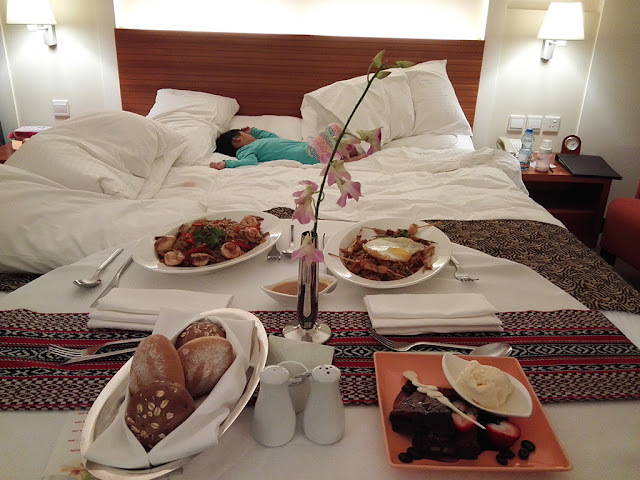 And as much as we wanted to go and try the buffet for dinner, the little one slept too early we had another in-room dining. Our choices were limited though as some restaurants are closed (Ramadan remember?). We ordered Asian style fried noodles with prawns and Nasi Goreng with Chicken Satay. The service came in a classy, elegant table setting. But we had to wait more than half hour to have them delivered. 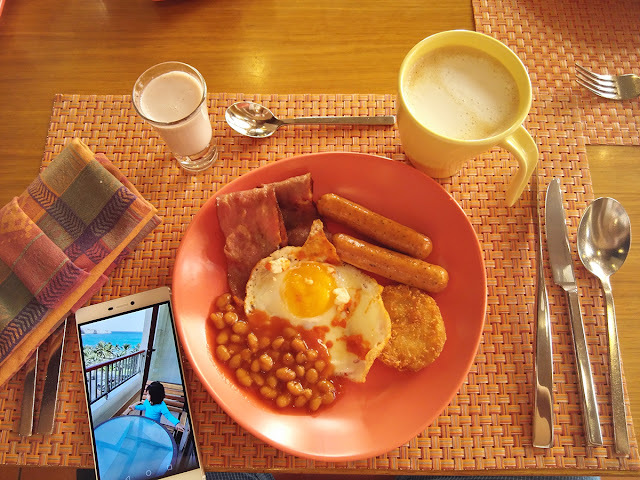 Samba was the only restaurant serving breakfast, lunch and dinner buffets. The breakfast has a wide range of options and was really good. We enjoyed it. Ham, bacon, sausages, baked beans and a live cooking station for our preferred omelette. There's also a section for cold cuts which includes smoked salmon, my favorite among others. Pancakes, waffles, yogurt, cereals, breads and pastries and the fresh fruit juices were all delectable. They also serve rich aromatic coffee. Lunch has a similar wide range of choices with more cuisine to choose from. 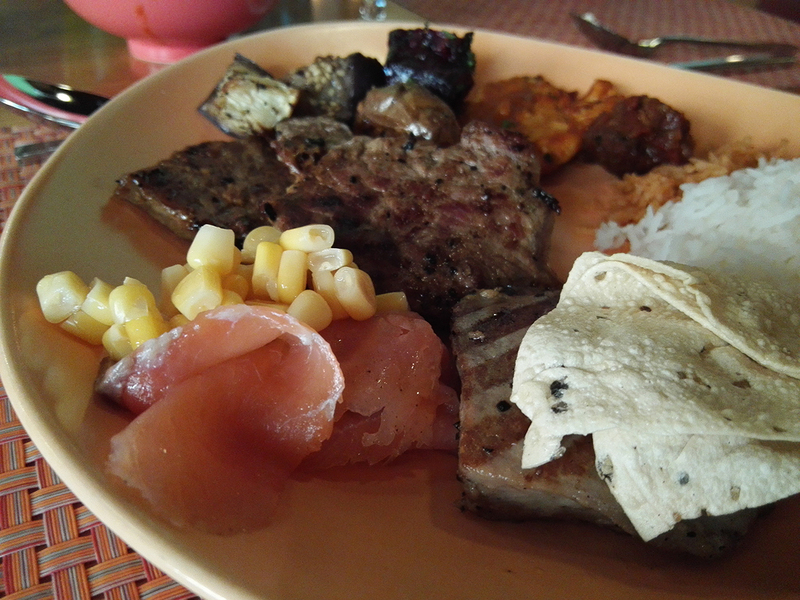 The grilled beef, chicken and fish were all good. On all buffets, there's always a section for kids (because they eat free), where the serving trays are placed in a lower table for their easy reach. In general, food is okay. But to be honest, I expected more. Probably the unavailability of some restaurants because of Ramadan has limited our options and we had to content ourselves with the available ones. We did not have maki and sushi, in contrast to what I was expecting. We prepared a little surprise party for the little one sans the grand decoration. 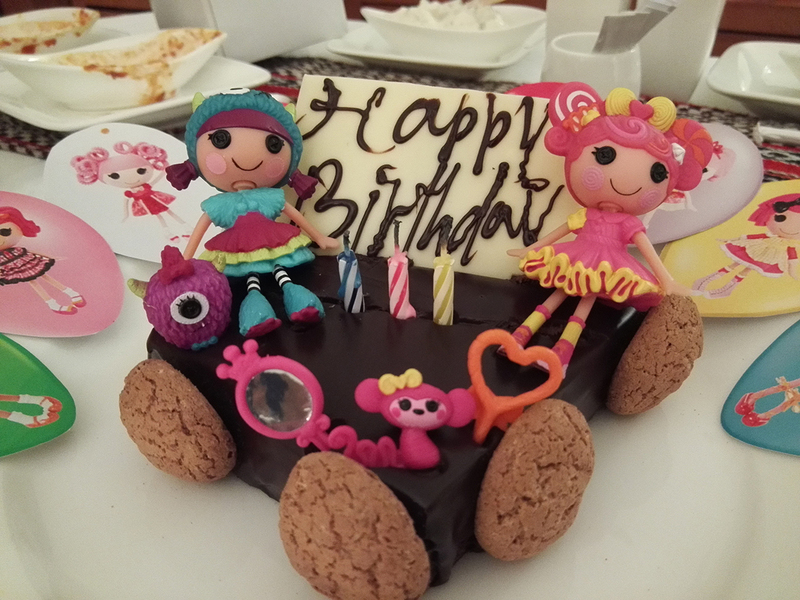 We knew that there's a complimentary cake from the hotel and we requested them to serve it on our last night. Knowing that these cakes are usually small, we prepared some decors to put in it. We also brought birthday candles. And yes, another in-room dining. We ordered kiddie meals, her favorite pasta, fish fingers and chicken nuggets. We were not informed by the telephone attendant though that the sauce has to be ordered separately. It was a light yet happy celebration. The glitter in her eyes when she's on the pool was more than enough to say how fulfilled she was. Overall, I'd give it 4 out of 5. Because despite the closure of many facilities, there's still quite a lot things to do. Too bad, we were not able to see the turtles on the other side of the beach, which is one of the most popular activities to do at the resort. According to the turtle ranger, the hawksbill and green turtle species are not usually hatching during this extreme weather condition and so we cannot see them. 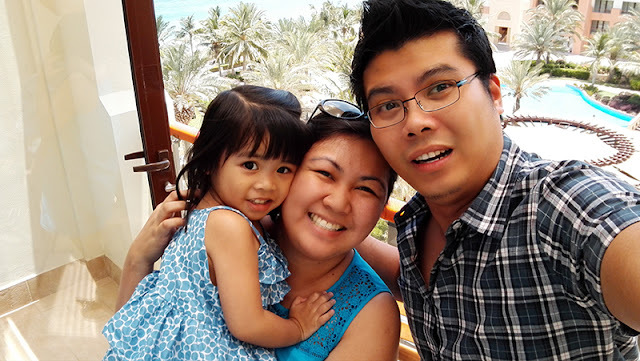 You know, in as much as we want to roam the popular attractions in the small city of Muscat, we decided not to. When you have a toddler, the least you wanna do is to max her energy. 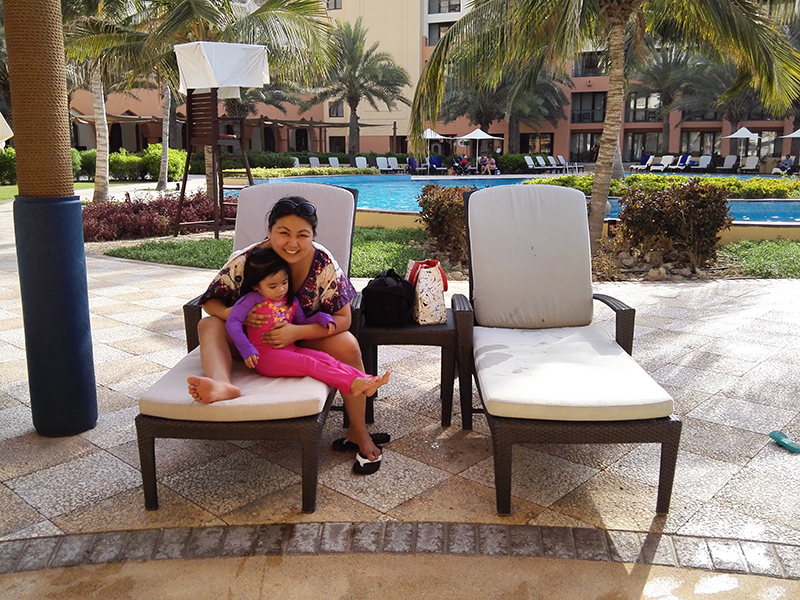 So we managed her activities and assured that she'd have more to enjoy in her playground (resort). 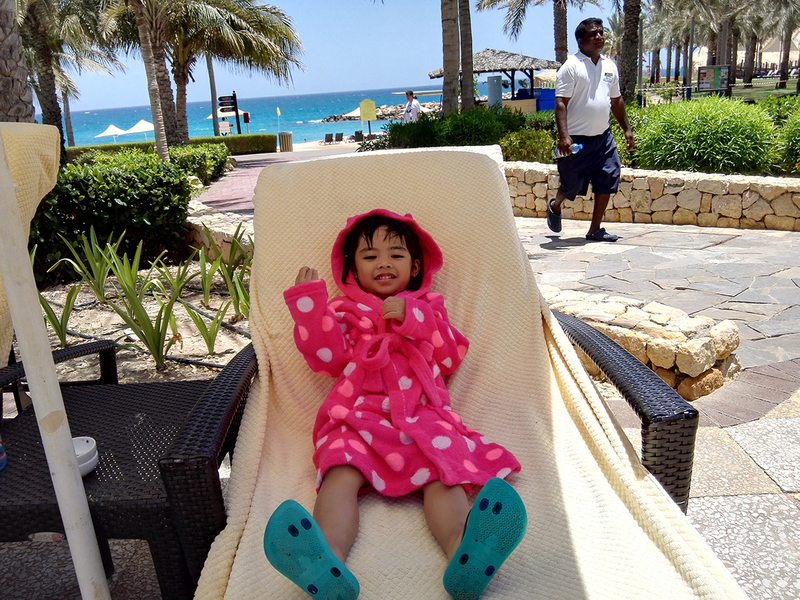 And as parents, we won't have fun at the souks and museums if what's in our daughter's mind are bouncy castles and swimming pool. We checked-out 2:00 pm. Our flight back to Dubai was 5:30 PM. 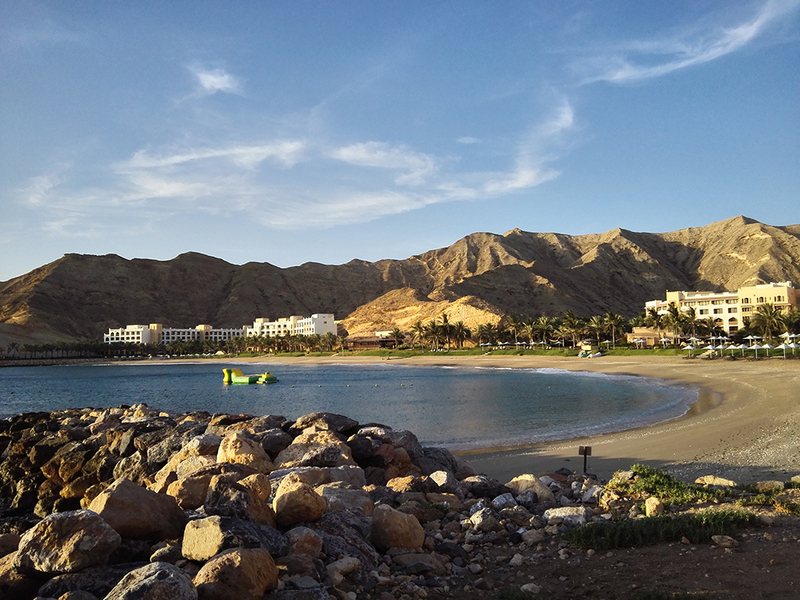 Next time you plan on a getaway but don't want to go too far from UAE, consider Muscat. The hotel stay in Shangri-La alone is an enchanting experience already. The staff are so polite and friendly I can see their kind hearts every time they smile at us. Regarding Oman visa, check your job title on your UAE visa. In my case, because I'm a software engineer, I am entitled to a visa on arrival in Muscat airport, and so my wife and daughter. Check this Oman Consulate in Dubai website for more info. Play time at Cool Zone - "no parents allowed"
You may check the rooms and the hotel rates here. For entry visa costs, click here. We were guests of Shangri-La Muscat, but this review and opinion are 100% my own.